How do you know for sure that you're managing compliance with labor laws and regulations correctly and accurately? Start by completing this checklist. Responses to a recent Kronos survey of 812 HR and payroll managers identified five key compliance readiness issues that organizations need to address to reduce risk of noncompliance. • Can I easily respond to and communicate to my organization about new regulations within 60 to 90 days? • Do I spend more time on duplicate data entry among various systems than I do on strategic initiatives? • Does my workforce management vendor provide education and tools that help my organization stay compliant? 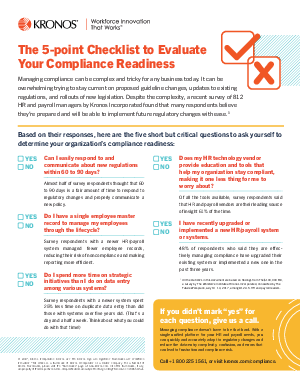 Download this piece and complete the entire checklist to see where your organization stands on compliance preparedness. You can also find out more about the Kronos single unified platform for HR and payroll that can help you adapt to regulatory changes and reduce the data-entry complexity, confusion, and errors that can lead to frustration and compliance risk.